Home » English » Come One, Come All to Chernobyl-Land! One of history's worst nuclear meltdowns took place 25 years ago, when a reactor exploded in Chernobyl, Ukraine, contaminating everything within 30 miles. 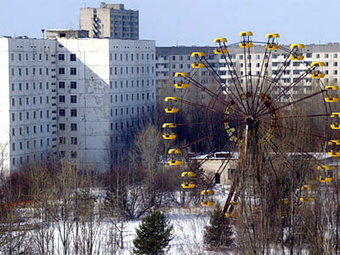 Now, the European country is ready to open up the once-radiated area to citizens and tourists alike. While parts of the blast site will be accessible, the whole area won't be open to roam because it's still very much radioactive. Experts are currently mapping out paths through the sealed-off site that they've believe have low enough radiation levels to walk through. 2500 employees currently work to maintain the blast site, and many have snuck in—some for unsanctioned tours, others who returned to their homes—despite the warnings and laws issued against doing so. There's no word yet on what the tour will entail, but I'll be disappointed if I can't bob for 20 pound apples and play a game of "Pin the Tail on the 10-Legged Rabbit."